Taro root makes for a filling side dish or a snack. Because this dish may be eaten cold, it is a popular choice for Shabbat meals. 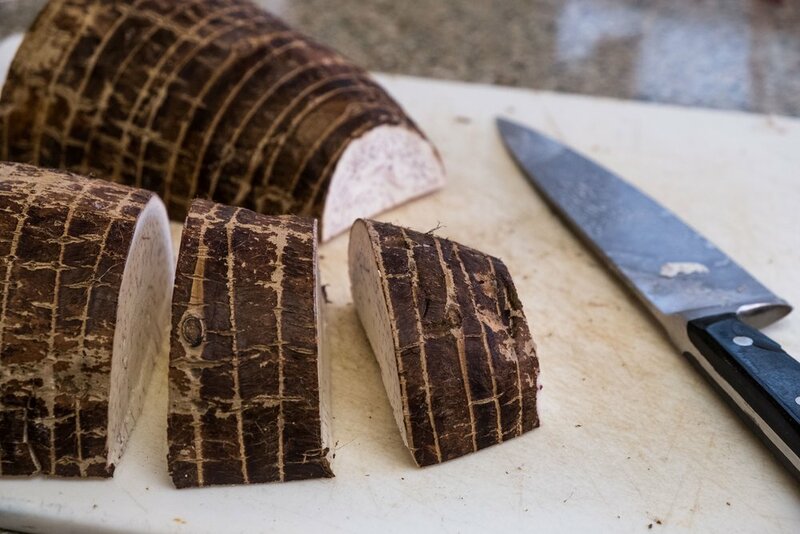 While it is becoming more common to find Taro root in mainstream supermarkets, specialty markets (particularly those with a focus on Mediterranean or Oriental cuisines) are still the easiest places to find taro. Cut the taro root into rather large pieces. It may be easiest to first chop the taro root in half and then cut those halves into the smaller (but still large) pieces. You can cut cut the taro root into smaller pieces after you boil it. Boil the taro root for about 20 minutes, or until tender all the way through. When it is ready, you will be able to easily move a knife or skewer through the root. Don’t overcrowd the pot, and it is best if you can keep the root from floating too much. If your pot is not large enough, you may need to boil several batches. After it’s boiled, cut the pieces into smaller pieces. 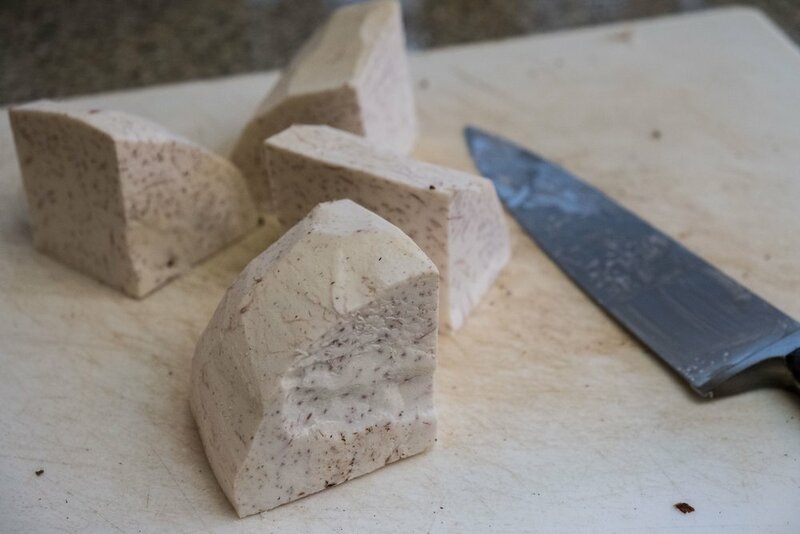 Some cooks prefer to cut the taro into dice-like cubes; others prefer wedges. 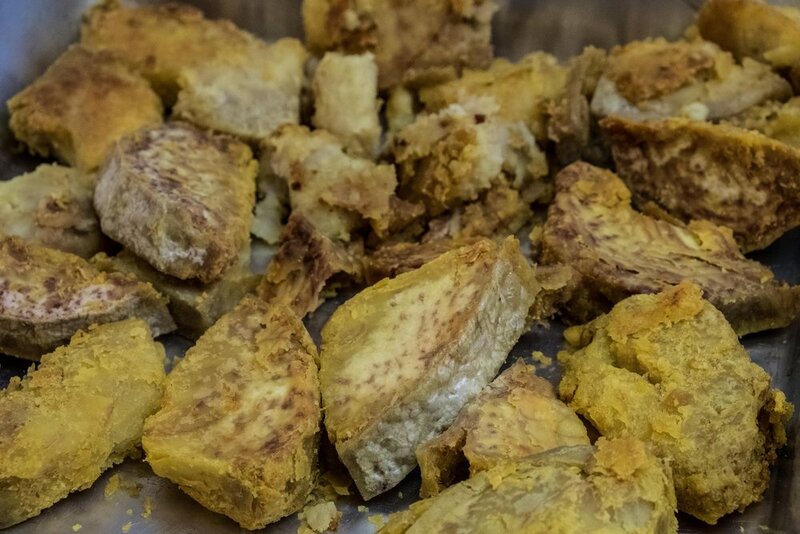 Note that taro crumbles very easily when cooked, so be careful while cutting the pieces and frying in the next step. Spread turmeric over the bottom of a pan and add plenty of your favorite cooking oil – really, virtually anything works. You may serve the dish hot, cold or at room temperature, and many people garnish the dish with parsley. The Karaite Kitchen is thankful for the contributions of Denise Ezial, who provided us with this recipe and allowed us to photo her work.